A promotion campaign is about to start in Bucharest. The City Council of Sector 1, through its mayor, Andrei Chiliman, is launching programs meant to highlight buildings and monuments. Several statues in Sector 1 will also be promoted. The Alley of the Caryatides in the Herastrau Park and the Village Museum will be presented to the public as tourist destinations. The banners, leaflets, websites and all the other promotion means will introduce these sites to both foreigners and the residents of Bucharest or people coming from the countryside. The funds were obtained through the Regional Operational Program 2007-2013 of the EU. The City Council of Sector 1 obtained a funding from the European Union, in the amount of approximately three million Lei. The local authorities intend to use the money in order to promote the historical monuments in the sector and attract tourists towards spending more time in the cultural areas. There are high chances that very soon the Capital will be included in the network of the European destinations of excellence! The major museums, historical monuments and cultural sites in Sector 1 shall be transformed into genuine tourist attractions. "Bucharest Wants You In Sneakers", "The Stone Men " and "Green Culture", are the three projects for which the local authorities have obtained European funds and which have been officially launched this week. In the project entitled “Bucharest Wants You in Sneakers” Andrei Chiliman recommends the Village Museum as a sight worth seeing and sends out an invitation to take long and frequent walks in the Herastrau Park, especially down the alley of the 20 caryatides, representing peasant women from the Muscel and Mehedinti regions, carrying jugs on their head. Here one will come across the Statue of Modura, a woman who is said to have offered water to King Carol II when the king was forced to land in the commune of Vadu Crisului. "It was in Sector 1 that the history of this city was written, and there are many buildings, museums and cultural sites awaiting to be promoted so that they may become known and appreciated by the tourists", Chiliman stated. The oldest school in the province of Tara Romaneasca, namely “Sf. Sava” (Saint Sava), will become a tourist site within the "Green Culture" project. The “Admiral Vasile Urseanu” Astronomic Observatory, the “Vasile Parvan” Museum of Archeology and the Victoria Passage will also be promoted. ”The projects initiated with the support of the European Union and Romanian Government are meant to highlight the cultural and historical legacy. Sector 1 can and will become a tourist attraction on the map of Europe” believes Razvan Munteanu, Project Manager. The project “Stone Men” shall focus on seven cultural sites, namely the statues of Barbu Stefanescu-Delavrancea, Nicolae Iorga, Monsenior Vladimir Ghica, Alexandru Lahovary, Iuliu Maniu, I.C. Bratianu, and General Charles de Gaulle. SECTOR 1. The major museums, monuments and cultural sites in sector 1 will be promoted through three projects with European funding amounting to approximately 3 million Lei. The City Council of Sector 1 in cooperation with the Government of Romania and the Ministry of Regional and Tourism Development, will carry out three projects - "Bucharest Wants You in Sneakers", "Stone Men" and "Green Culture" aimed to revive cultural tourism in the Capital. The project implementation term is 6 months. The City Council of Sector 1 seeks to increase the number of tourists by 5 per cent and it intends to achieve this goal by means of three tourism promotion projects amounting to approximately 3 million Lei, to be financed from European funds. Yesterday, the City Council of Sector 1 launched three tourism promotion projects amounting to a total of 3 million Lei, to be financed from European funds. The three projects aim to increase the visibility at local and national level of several cultural sites in Sector 1 that have a high tourism potential. At the same time, the three projects seek to improve the tourism offer by creating a new itinerary which would include the contemplated cultural sites. Thus, the "Green Culture" project will help promote four cultural sites in Sector 1, declared historical monuments and part of the national cultural heritage. These four cultural sites are the "Admiral Vasile Urseanu" Astronomic Observatory, the “Vasile Parvan” Museum of Archeology, the “Sf. Sava” National College and the Victoria Passage. The “Stone Men” project shall attempt to increase the visibility of seven monuments in Sector 1: the statues of Barbu Stefanescu Delavrances, of Monsenior Vladimir Ghika, the bust of Nicolae Iorga, the statue of Alexandru Lahovary, of Iuliu Maniu, of I.C. Bratianu and of General Charles de Gaulle. The third project, entitled “Bucharest Wants You In Sneakers” seeks to promote other three cultural sites in Sector 1, namely the Herastrau Park, the Alley of the Caryatides and the “Dimitrie Gusti” National Village Museum. "With these projects, we seek to increase the attractiveness of certain sites that are part of the cultural heritage in Sector 1, and to promote them in such a way so as to have Romania included in just a few years in the network of tourism destinations of excellence. Today, Bucharest cannot be considered a tourism destination. Whoever comes to Bucharest today, does so out of curiosity, just to see how things are around here. But Bucharest has so many beautiful things to show, it's just that they have not been revealed and placed in proper tourist circuits. So this is what we wish to achieve, " said Andrei Chiliman. According to Razvan Munteanu, Manager, the fulfillment of these three projects is expected to generate a 5 per cent increase, namely by 5.000, of the number of tourists that visit sector 1. Additionally, by these projects, an attempt is made to draw attention upon some of these monuments which are in a rather poor state, such as the "Admiral Vasile Urseanu" Astronomic Observatory and the "Vasile Parvan" Museum of Archeology (the Macca House). Each project provides that a dedicated web-site be created. Moreover, promotion material shall be produced and distributed, in the form of leaflets, fliers, pamphlets, albums, maps, post cards, posters and DVDs. A TV campaign shall be carried out at the same time and advertisement panels shall be set up on the great boulevards in the major cities of the country. Furthermore, two artistic events shall be organized in the Kiseleff and Herastrau Parks. The City Council of Sector 1 obtained funding from the European Union, in the amount of approximately three million Lei. The local authorities intend to use the money in order to promote the historical monuments in the sector and attract tourists towards spending more time in the cultural areas. There are high chances that very soon the Capital will be included in the network of the European destinations of excellence! The major museums, historical monuments and cultural sites in Sector 1 shall be transformed into genuine touristic attractions. "Bucharest Wants You In Sneakers", "The Stone Men " and "Green Culture", are the three projects for which the local authorities have obtained European funds and which have been officially launched this week. The implementation term of the projects “Bucharest Wants You in Sneakers”, “Stone Men” and “Green Culture” shall be 6 months. “The strategy of urban regeneration, which means increasing life standards, also implies highlighting the cultural and historical heritage of Sector 1” stated Andrei Chiliman, Mayor of Sector 1. The major museums, monuments and cultural sites in Sector 1 shall be promoted by means of three projects with European funding amounting to approximately 3 million Lei. The City Council of Sector 1 in cooperation with the Government of Romania and the Ministry of Regional and Tourism Development, will carry out three projects - "Bucharest Wants You in Sneakers", "Stone Men" and "Green Culture" aimed to revive cultural tourism in the Capital. The project implementation term is 6 months. “The strategy of urban regeneration, which means increasing life standards, also implies highlighting the cultural and historical heritage of Sector 1. It was in Sector 1 that the history of this city was written, and there are many buildings, museums and cultural sites awaiting to be promoted so that they may become known and appreciated by the tourists", declared Andrei Chiliman, Mayor Sector 1 on the occasion of the project launching conference. The project “Bucharest Wants You In Sneakers” will promote three cultural sites: the Herastrau Park, the Alley of the Caryatides and the “Dimitrie Gusti" National Village Museum. 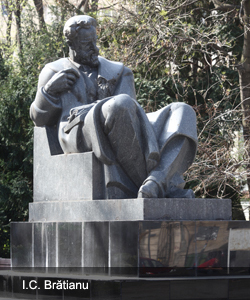 The “Stone Men” project promotes seven cultural sites: the statues of Barbu Ştefănescu Delavrancea, Monsenior Vladimir Ghika, the bust of Nicolae Iorga, the statues of Alexandru Lahovary, Iuliu Maniu, I.C. Brătianu, General Charles de Gaulle. The “Green Culture” project promotes four cultural sites: the 'Admiral Vasile Urseanu' Astronomic Observatory, the 'Vasile Pârvan' Museum of Archeology, the 'Sf. Sava' National College and the Victoria Passage. "The projects initiated today with the support of the European Union and the Romanian Government are meant to highlight the cultural and historical heritage. Sector 1 can and will become a tourism attraction on the map of Europe", stated Răzvan Munteanu, Project Manager. The projects are financed through the Regional Operational Program 2007-2013, Priority Axis 5 – Durable Development and Promotion of Tourism', Major Field of Intervention 5.3. - 'Promotion of Tourism Potential and Creation of the Necessary Infrastructure, with a view to increasing the attractiveness of Romania as a travel destination', Operation - 'Development and consolidation of domestic tourism by assisting the promotion of specific products and specific marketing attractions'. The City Council of Sector 1 will create a tourist itinerary which will include the most significant cultural sites existing on its administrative territory. In order to promote this itinerary, the institution accessed European funds in the amount of three million Lei. The implementation of the project is to start in April, and the results will become visible in six months. F.A. The City Council of Sector 1 will create a tourist itinerary which will include the most significant cultural sites existing on its administrative territory. In order to promote this itinerary, the institution accessed European funds in the amount of three million Lei. The implementation of the project is to start in April, and the results will become visible in six months. The tourist sites included in this tourism itinerary are: the Herastrau Park, the Alley of the Caryatides, the „Dimitrie Gusti” National Village Museum, the Statutes of Barbu Stefanescu Delavrancea, Monsenior Vladimir Ghika, the Bust of Nicolae Iorga, the statutes of Alexandru Lahovary, Iuliu Maniu, I.C. Bratianu, General Charles de Gaulle, the „Admiral Vasile Urseanu" Astronomic Observatory, the „Vasile Parvan” Museum of Archeology, the „Sf. Sava” National College and the Victoria Pedestrian Passage. The cultural sites are declared historical monuments and are part of the national cultural heritage. According to the representatives of the institution, the goal of this project is to attract more tourists but, at the same time, to draw the attention of the people of Bucharest to these historical monuments, many of whom have no knowledge of their existence. The third objective is to compel public institutions to renovate and care for these monuments, which are under their administration. The City Council of Sector 1 shall set up a tourist itinerary which will include the most important cultural sites on its administrative territory. In order to promote the itinerary, the Institution accessed European funds in the amount of three million Lei. The project implementation shall start in April, and the results will become notable after six months. The project 'Bucharest Wants You In Sneakers” will promote three cultural sites: the Herastrau Park, the Alley of the Caryatides and the “Dimitrie Gusti" National Village Museum. ˇThe “Stone Men” project promotes seven cultural sites: the statues of Barbu Ştefănescu Delavrancea, Monsenior Vladimir Ghika, the bust of Nicolae Iorga, the statues of Alexandru Lahovary, Iuliu Maniu, I.C. Brătianu, General Charles de Gaulle. ˇThe 'Green Culture' project promotes four cultural sites: the 'Admiral Vasile Urseanu' Astronomic Observatory, the 'Vasile Pârvan' Museum of Archeology, the 'Sf. Sava' National College and the Victoria Passage. 'The projects initiated today with the support of the European Union and the Romanian Government are meant to highlight the cultural and historical heritage. Sector 1 can and will become a tourism attraction on the map of Europe', stated Răzvan Munteanu, Project Manager. The projects are financed through the Regional Operational Program 2007-2013, Priority Axis 5 – Durable development and Promotion of Tourism', Major Field of Intervention 5.3. - 'Promotion of Tourism Potential and Creation of the Necessary Infrastructure, with a view to increasing the attractiveness of Romania as tourist destination', Operation - 'Development and consolidation of domestic tourism by assisting the promotion of specific products and specific marketing attractions'. Today, the City Council of Sector 1 launched three tourism promotion projects amounting to approximately 3 million Lei, which shall be financed from European Funds. The three projects aim to increase the visibility of several cultural sites having a great tourism potential in Sector 1. Furthermore, the projects seek to improve the tourist offer by creating a new tourist itinerary that would include such sites. The project 'Bucharest Wants You In Sneakers” will promote three cultural sites: the Herastrau Park, the Alley of the Caryatides and the “Dimitrie Gusti" National Village Museum. ˇThe “Stone Men” project promotes seven cultural sites: the statues of Barbu Ştefănescu Delavrancea, Monsenior Vladimir Ghika, the bust of Nicolae Iorga, the statues of Alexandru Lahovary, Iuliu Maniu, I.C. Brătianu, General Charles de Gaulle. ˇThe 'Green Culture' project promotes four cultural sites: the 'Admiral Vasile Urseanu' Astronomic Observatory, the 'Vasile Pârvan' Museum of Archeology, the 'Sf. Sava' National College and the Victoria Passage. Each project provides that a dedicated web site be created. Moreover, promotion material will be produced and distributed, such as leaflets, fliers, pamphlets, albums, maps, post cards, posters and DVDs. At the same time, a TV campaign will be conducted and advertisement panels set up on the large boulevards of the major cities in the country. Additionally, two artistic events will be organized in the Kiseleff and Herastrau Parks. The term of the projects is six months. As result of these projects being carried out, the local authorities expect the number of tourists in Sector 1 to increase by 5 per cent, i.e. by 5.000 tourists. The programs are financed through the Regional Operational Program 2007-2013. The project “Bucharest Wants You In Sneakers” will promote three cultural sites: the Herastrau Park, the Alley of the Caryatides and the “Dimitrie Gusti" National Village Museum. ˇThe “Stone Men” project promotes seven cultural sites: the statues of Barbu Ştefănescu Delavrancea, Monsenior Vladimir Ghika, the bust of Nicolae Iorga, the statues of Alexandru Lahovary, Iuliu Maniu, I.C. Brătianu, General Charles de Gaulle. ˇThe 'Green Culture' project promotes four cultural sites: the 'Admiral Vasile Urseanu' Astronomic Observatory, the 'Vasile Pârvan' Museum of Archeology, the 'Sf. Sava' National College and the Victoria Passage. The City Council of Sector 1 accessed non-repayable European funds in the amount of 3 million Lei, in order to create a tourism itinerary that includes the most important cultural sites existing on its administrative territory. The implementation of the project shall start in April and the results will become notable in six months, according to HotNews. The tourist sites included in this tourist itinerary are: the Herastrau Park, the Alley of the Caryatides, the „Dimitrie Gusti” National Village Museum, the Statues of Barbu Stefanescu Delavrancea, Monsenior Vladimir Ghika, the Bust of Nicolae Iorga, the statutes of Alexandru Lahovary, Iuliu Maniu, I.C. Bratianu, General Charles de Gaulle, the „Admiral Vasile Urseanu" Astronomic Observatory, the „Vasile Parvan” Museum of Archeology, the „Sf. Sava” National College and the Victoria Pedestrian Passage. The cultural sites are declared historical monuments and are part of the national cultural heritage. According to Alex Ichim, the spokesman for the City Council of Sector 1, the money raised will be used to create a web site with information on the tourist itinerary and the sites included, the installation of informative panels along this itinerary, the promotion of the itinerary in the media, the set-up of new information points, the production of informative leaflets to be distributed in hotels. The 'Green Culture' project promotes four cultural sites: the 'Admiral Vasile Urseanu' Astronomic Observatory, the 'Vasile Pârvan' Museum of Archeology, the 'Sf. Sava' National College and the Victoria Passage. In the following six months, the City Council of Sector 1 will implement three European projects for tourism promotion, in the amount of approximately 3 million Lei. They include monuments more or less known in Bucharest, as well as cultural sites with high tourism potential. The three European projects that the City Council wishes to implement in the following six months aim to revive cultural tourism at both local and regional level. “The name of the project is not necessarily a mistake. It sprung from an idea that came to me as I recalled the times when, as a child, I would play ball in front of my flat building. I would tell my friends: "Let me get my sneakers and I'll come out to play." The people at the Ministry (the Ministry of Regional and Tourism Development) thought it was interesting and proposed that we keep this form” explain Razvan Munteanu, Project Manager. The Cultural Quadrant (“Green Culture”) promotes four cultural sites having a high tourism potential, by creating a new tourist itinerary that would include these sites: the "Admiral Vasile Urseanu" Astronomic Observatory, the "Vasile Parvan" Museum of Archeology, the "Sf. Sava" National College and the Victoria Passage. With the Monument Heptagon (“Stone Men”), the local administration wishes to increase the number of people visiting seven cultural sites declared historical monuments: the statues of Barbu Stefanescu Delavrancea, Monsenior Vladimir Ghika, the bust of Nicolae Iorga, the statues of Alexandru Lahovary, Iuliu Maniu, I.C. Bratianu and General Charles de Gaulle. “We sought to enhance the attractiveness of the tourist sites that are part of the cultural heritage, and promote such sites so that the respective projects will cause Romania to be included, in just a few years' time, among the travel destinations of excellence. Those who come now to Bucharest, do so out of curiosity, they want to see how things are around here. It is not a travel destination in itself. But with the project, important monuments will be highlighted and placed in a proper tourist circuit" explained Andrei Chiliman, Mayor of Sector 1. As Razvan Munteanu, Project Manager pointed out, local authorities intend to increase the number of tourists who visit these tourism sites by 5 per cent, which means that in six months’ time, there should be 5.000 more tourists passing before these monuments. The three tourism development projects initiated in Sector 1 are financed from European funds and amount to a total of approximately 3 million Lei. The authorities will use the money to create web-sites and to print and distribute promotion materials such as leaflets, fliers, pamphlets, albums, maps, post cards, posters and DVDs. In addition two artistic events will be organized in the Kiseleff and Herastrau Parks. • The project 'Bucharest Wants You In Sneakers” will promote three cultural sites: the Herastrau Park, the Alley of the Caryatides and the “Dimitrie Gusti" National Village Museum. • The 'Green Culture' project promotes four cultural sites: the 'Admiral Vasile Urseanu' Astronomic Observatory, the 'Vasile Pârvan' Museum of Archeology, the 'Sf. Sava' National College and the Victoria Passage. • The “Stone Men” project promotes seven cultural sites: the statues of Barbu Ştefănescu Delavrancea, Monsenior Vladimir Ghika, the bust of Nicolae Iorga, the statues of Alexandru Lahovary, Iuliu Maniu, I.C. Brătianu, General Charles de Gaulle. Today, the City Council of Sector 1 launched three tourism promotion projects amounting to approximately 3 million Lei, which shall be financed from European Funds. The three projects aim to increase the visibility of several cultural sites having a great tourism potential in Sector 1. Furthermore, the projects seek to improve the tourist offer by creating a new tourist itinerary that would include such sites. Each project provides that a dedicated web site be created. Moreover, promotion material will be produced and distributed, such as leaflets, fliers, pamphlets, albums, maps, post cards, posters and DVDs. At the same time, a TV campaign will be conducted and advertisement panels set up on the large boulevards of the major cities in the country. Additionally, two artistic events will be organized in the Kiseleff and Herastrau Parks. The term of the projects is six months. As result of these projects being carried out, the local authorities expect the number of tourists to in Sector 1 increase by 5 per cent, i.e. by 5.000 tourists. The programs are financed through the Regional Operational Program 2007-2013. The City Council of Sector 1 is launching two projects on March 14th, 2012, The projects, entitled “Stone Men” and “Bucharest Wants You In Sneakers”, are meant to revive tourism in the area. The main purpose of the “Bucharest Wants You In Sneakers” project resides in the increase of the degree of visibility of the 3 (three) cultural sites, having a high tourism potential in Sector 1, namely the Herastrau Park, the Alley of Caryatides and the “Dimitrie Gusti” National Village Museum (the Village Museum). In addition, the project “Bucharest Wants You In Sneakers”, also seeks to improve the tourist offer by creating a new tourist itinerary which will include the cultural sites mentioned here. The promotion of these sites as part of the “Bucharest Wants You In Sneakers” project represents an initiative that comes to supplement other initiatives of the local administration of Sector 1, concerned with increasing the attractiveness of tourism at regional, national and local level. The projects will be launched during two press conferences organized in the Council Hall of the City Council of Sector 1, located in 9-13 Sos. Bucuresti – Ploiesti, 7th Fl, on March 14th, 2012 at 12:00h in case of the second project and at 13:00 in case of the first project mentioned in this article. “The strategy of urban regeneration, which means increasing life standards, also implies highlighting the cultural and historical heritage of Sector 1. It was in Sector 1 that the history of this city was written, and there are many buildings, museums and cultural sites awaiting to be promoted so that they may become known and appreciated by the tourists”, declared Andrei Chiliman, Mayor Sector 1 on the occasion of the project launching conference. “The projects initiated today with the support of the European Union and the Romanian Government are meant to highlight the cultural and historical heritage. Sector 1 can and will become a tourism attraction on the map of Europe”, stated Răzvan Munteanu, Project Manager.